Welcome to the Red Pre-K Room! Our Red Pre-Kindergarten Program enrolls 18 children with 3 teachers. Our rich, literacy-based curriculum and active, hands-on learning environment is designed to meet the needs and interests of 4-year-old and young 5-year-old children. Our Red Pre-K program takes place in a large, double classroom with a maximum enrollment of 18 children and 3 teachers on full program days. This program provides an active, hands-on, curriculum rich, literacy-based learning environment for 4-year-old children which builds on the concepts and experiences learned in our Blue and Orange classrooms. We continue to focus on social-emotional development while providing opportunities for further language, writing, cognitive, physical and creative development. A writing center and a center for listening to recorded stories on tape build a foundation and encourage an interest in reading and writing. Large hollow blocks are unique to the Red-PreK classroom offering chances for gross motor development and dramatic play scenarios. During play, teachers promote cooperation among peers, allowing children to identify problems and develop their own solutions to these problems. The daily schedule includes activities for the whole group as well as a special activity time for teachers to observe and work with children in a small group setting. Small groups allow teachers to focus on each child individually and gather information which is used to guide weekly curriculum and adapt classroom exercises to meet children’s individual developmental needs. Outdoor play is an integral part of our curriculum and children go outside each day, weather permitting. Our playground, gardens and grassy play area provide extensive outdoor activity choices in every season. 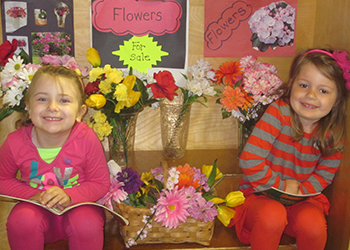 Our full day preschool program includes a quiet rest time for all children. Rest time provides up to 2 hours sleep time. Children who no longer nap spend some down time listening to music followed by quiet reading on their cots. Quiet afternoon activities are offered until all children wake up at 3:00 p.m. Our planned afternoon curriculum is an extension of the concepts and skills introduced in the morning program. Incorporating new, additional learning materials unique to the afternoon program promotes continued engagement and interest in a relaxed environment allowing children additional opportunities to revisit and practice previously learned skills and concepts. 9:30 am – 9:50 am Group Time - attendance, calendar, weather, songs, etc.